CSV (Comma Separated values) files are plain-text files having extension (.csv or .txt) that contains data-values that are separated by commas. The first line in the file must be the Header-line and is followed by data-rows. CSV files can be directly opened/ viewed in MS-Excel. 1) Download and unzip the ledger-master-csv.zip file. 5) Select option "Excel to Tally"
Set option "Files of Type" as "All files"
After setting option "Files of Type" as "All files", select the CSV file named "Ledger-master". 8) Next, select the XML tags file "Ledger-Master.xml". 9) Next, click on the START button to import data into Tally. If everything goes fine, then ONE Ledger-Master record (named Shweta Softwares) will be imported into Tally. You can view the same using option "Gateway of Tally >> Accounts Info >> Ledger >> Alter" and check for Ledger named "Shweta Softwares". 1) The "Excel to Tally" feature can be used to import data from both MS-Excel files or CSV files. 2) For importing data from other sources like SQL-Server; MySQL; Access; DBF-files and popular databases, you must use the "Advanced Usage" option in UDIMagic software. 3) UDIMagic identifies data in the source-file (MS-Excel or CSV or Database-files) based upon the mapping given in the XML-file and constructs proper XML tags which are supported by Tally Software. UDIMagic v3.0 Release 1.60 comes with a new feature called Auto-Run. What is Auto Run ? The Auto Run feature allows you to setup UDIMagic to run automatically without any User-intervention. 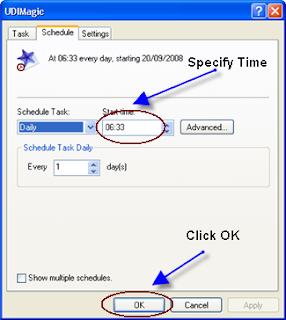 Once this feature is enabled, you can add UDIMagic to "Windows Scheduler" to run UDIMagic at scheduled timings. How to enable the Auto Run mode in UDIMagic ? 1) Start UDIMagic and follow the wizard instructions to import data as you normally do. 2) In the Settings screen, click on the "Enable Auto Run" check-box to enable it. 3) Next, click on the Start button to import data into Tally. This now enables Auto-Run mode; and few lines are added to the UDIMagic.ini (configuration) file. You can also manually edit the UDIMagic.ini (configuration) to enable/disable the Auto-Run feature. 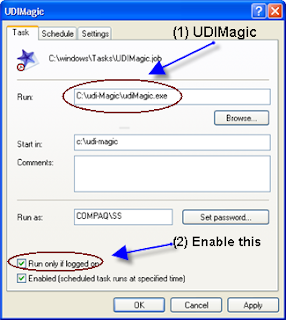 How do I add UDIMagic to Windows Scheduler ? 1) From the Windows Start menu, select "Settings >> Control Panel"
This displays all the currently scheduled tasks. 3) Next, select "File >> New >> Scheduled Task"
4) Give a name to the Task, say UDIMAGIC. This will auto-run UDIMagic at the schedule timings. 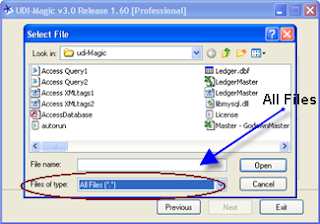 1) In the Auto-Run mode, a file named "Autorun.log" is created which records the UDIMagic process activites. This is generally useful for keeping track of Data imported; or errors (if any). 2) When the Auto-Run mode is enabled, manually starting UDIMagic will display a AUTO-RUN Splash screen that allows you to Skip or Disable the Auto-Run mode.